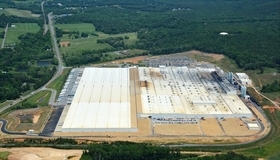 Toyo Tire's North American manufacturing facility in White, Ga.
ATLANTA —The state of Georgia and Bartow County have agreed to provide economic assistance to support an ongoing expansion of Toyo Tire North America Manufacturing Inc.'s factory in White, Ga. The project, announced in October 2017 and valued at $138 million, will add 2.4 million units of annual manufacturing capacity and more than 150 jobs at the 12-year-old factory in White, Toyo said. The Bartow-Cartersville Joint Development Authority has authorized the issuance of bonds valued at $550 million to assist Toyo with its expansion project, and the Georgia Department of Economic Development (GDED) is providing as-yet undisclosed incentives for Toyo to increase its investment in the state, Toyo said. Upon completion of the 254,000-sq.-ft. expansion, employment at the plant will total about 2,100, Toyo said, generating nearly $135 million in wages and benefits. Annual output will rise 21 percent to nearly 14 million units. "Bartow County has been fortunate to be selected as Toyo Tires' home years ago, and we are honored each time they choose to invest again," Bartow County Sole Commissioner Steve Taylor said. "We strive for long-term partnerships with our industries and this partnership has been incredibly successful." Taylor lauded Toyo for its corporate citizenship and community involvement, noting donations and volunteer hours to the county's schools, environmental causes and citizens in need. Toyo North America President Don Bunn said the level of cooperation Toyo has received from the state of Georgia and Bartow County over the years "continues to exceed our expectations. "Toyo Tires is proud to be a member of the Georgia business community and strives to show its appreciation by being a great place to work and by supporting community organizations throughout the state." Toyo also pointed to the its continued collaboration with Georgia Quick Start, the state's award-winning workforce development program, as playing an integral part in its success. Bartow County is a Georgia Certified Work Ready Community, Toyo said, a designation showing the county has the skilled workforce needed to meet the needs of business and the educational foundation to build a supply of workers.